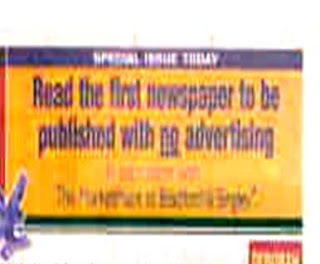 To promote the launch of a new product called 'The Marketplace', Bradford & Bingley took over the Independent for the day - creating the 'first newspaper with no advertising.' Bradford & Bingley Marketplace have bought all of the ad sites in the Independent and have then run no advertising on them - an ad free paper! There was a front cover flash explaining that there was no advertising and a 9x1 editorial footnote on the front page explaining that this was due to the sponsorship of Bradford & Bingley Marketplace. This stunt got a lot of PR - though I am not sure how much awareness it created for Bradford & Bingley. 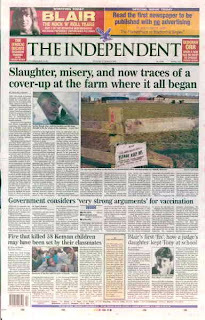 A number of people have since taken all the ads in an issue (X-Box in Metro, Orange in the Times, O2 in the Evening Standard), but as far as I am aware this remains the only time an advertiser has paid to remove all ads from a newspaper.